Feed The Woozle is an exciting game where players will need to physically feed the Woozle snacks with a spoon before all the snacks are gone. 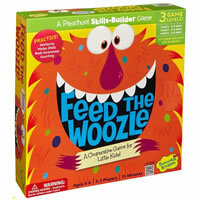 Kids will have a blast playing this hands on game, spinning the spinner and feed the Woozle. Brightly colored and designed just for kids, Feed The Woozle is sure to make their day. The official game rules come in handy when those playing are older than three. Different variations are available for older kids and include playing the game with your eyes closed. We'd love to hear about your experience playing this great game and knowing what you think about it. Purchase your copy of Feed The Woozle today or keep it as a gift for the next birthday party. Be become the Feed The Woozle champion, you'll need to feed the Woozle 12 snacks before all the snacks are gone. This game comes with 1 stand-up Woozle, 24 silly snacks, 12 yummy cards, 1 die, 1 spinner, 1 spoon and the official Feed The Woozle game rules and instructions. Please keep in mind that the official Feed The Woozle childrens rules and instructions could be different depending on the game version you have. The rules below are some of the exact directions on how to play Feed The Woozle. Share with us your comments, funny stories, tips, advice, strategies, creative ways to play, questions about how to play, problems with the rules or anything you want about Feed The Woozle. All submissions will be reviewed within 24 hours. Click here to add your Feed The Woozle comments.